February, the year’s shortest month, made record-low sales. Yes, in February, I “only” made £14k in sales on Amazon UK. Obviously, I’m not happy about that. Even though last year’s sales were only a tad higher, a drop of £1k this year is NOT a trend I would like to see continue. 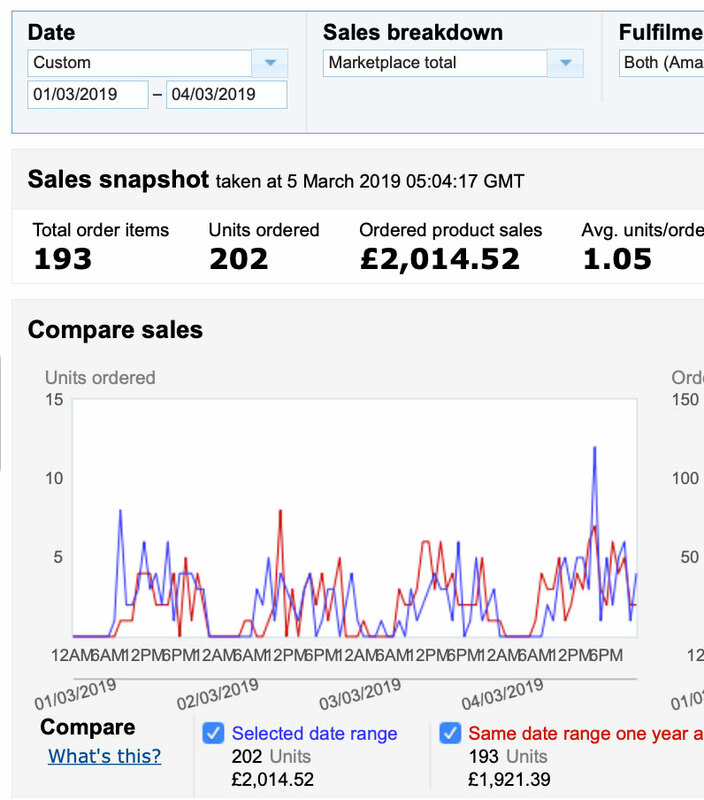 Since I have set my Amazon sales target at £300k this year, compared to £240k in sales last year, I can’t really afford to have bad months like this if I want to reach my target. I do, however, have a plan of action for how to deal with this, but more on that later. The competition in my niche has definitely increased over the last year, so that’s a big factor contributing to the decline in sales. Also, I am a little bit worried that, because I sell just one product with multiple variations, my current list of variations may have become overexposed, meaning that people who have bought the product from me already haven’t seen anything new. Perhaps they are now choosing different brands purely because of this factor (the product I sell is essentially a consumable that is purchased somewhat regularly). I have already covered the competition part extensively in my January update post, so there’s not much I can do about that on Amazon alone—but just wait until I get started on Shopify! :). The product range/variations part is something I can improve, and I’m already working on it! Two new SKUs are in production as we speak, and when I launch them on Amazon in April, it should help me “freshen up” my product offerings. I have also re-done ALL of the product images to further improve them, and I would like to start doing product videos as soon as Amazon releases that feature! It has been LIVE on Amazon.com for many months now, so I don’t really understand why they’re delaying the UK launch. That said, I am standing by, ready to go with videos as soon as it happens. The plan is actually to create these videos even sooner, as I will want to use them on my online shop and social media as part of my advertising strategy. So, is it all doom and gloom? No, not at all! 🙂 The business still made a NET profit of more than £4k, and what’s more important than that? I’m making good progress on the eCommerce shop, wholesale business, EU expansion and trade shows, all of which I will cover in more detail at the end of this post. But for now, I want to quickly cover a new feature that Amazon just recently released called Dynamic Bids and Placement Bids. I did some extensive testing on these new features in January and February, so the results are finally in. Let’s get started with that! So, what are these new features and how do they work? Dynamic and Placement Bids are basically automated tools that, from Amazon’s perspective, can help us get more sales by out-bidding our competitors in certain situations. In the classic way of bidding, you set a maximum bid price that you’re willing to pay for each click. For example, if you’re targeting the keyword “pink socks”, you can set your maximum bid to £1. This doesn’t mean that Amazon will charge you £1. It will charge the highest amount over any other bidder for that same keyword up to £1. But for the sake of simplicity, let’s assume that you’re actually paying £1 for each click. With the new Dynamic Bid feature, you now have the option to give Amazon permission to pay MORE for those clicks if Amazon believes that the click is more likely to convert to a sale. In reality, it means that if you have enabled this setting, Amazon may charge you £2 for the click—up to 200% of your original bid—outbidding everyone else in cases where Amazon thinks that the click will most likely convert. The new Placement Bid works in a very similar way. You can set it so that your bid can automatically be increased by up to 900% (NINE TIMES!!!) by Amazon, just so you get the FIRST position in the search results or guaranteed display of your ad in various placements on Amazon. For example, let’s say you pay £1 per click and that gives you 2nd position in search. With the new Placement Bid feature, you could bid £2 or £3 (automatically) to get to the 1st result in search. So you can outbid everyone else to get better positions, BUT the question is whatever it is worth paying that premium price? It’s VERY hard to monitor and test this and my feeling was that I was simply paying more, for same results. What I have discovered from my tests is that this actually does more harm than good. Your ACoS will be out of control when you start using Dynamic Bids, and I didn’t even see that much of a traffic/sales increase (it is quite challenging to accurately monitor this, of course, as there are so many variables). I don’t think Amazon’s AI is currently good enough to predict when a click will convert a sale, which is the whole idea behind this new Dynamic Bids feature. In fact, we know that this is not the case because otherwise the existing Auto campaigns would bring nothing but profit, right? Let’s not forget that Amazon is a BUSINESS at the end of the day and their main job is to make money. This is especially true today because the PPC part of Amazon’s profit pie has grown significantly. Amazon is now looking for all kinds of ways to increase their revenue, boost click prices, etc. That’s why they have introduced all of these new placements and everything else. On some very vague data assumption, you allow Amazon to charge you MORE for the same clicks that you would probably have gotten (or not gotten) anyway. Who knows what’s going on behind the scenes. It’s such a big piece of the robot that it’s hard to single out or predict anything meaningful. I don’t think even Jeff Bezos knows how it all works. 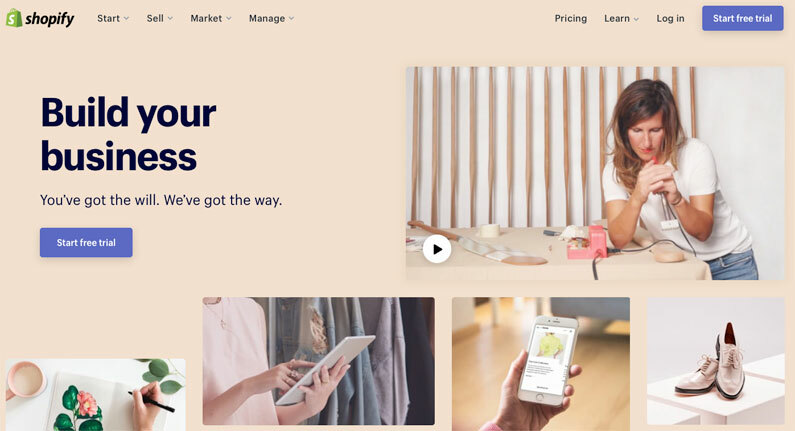 Essentially, there’s currently not much that sellers gain from this new feature. All you really get is a higher click price, at least from my experience. I have also talked with few AdWords experts who have agreed that a similar feature is available for Google Ads, too. It essentially just permits Google to charge more for clicks than is necessary. It’s a smart way of overcharging everyone. Mind you, these are just my tests and my experience. It’s entirely possible that these new features could work for other products or other markets/competition models. But if you’re just starting out, I would recommend that you DON’T USE THEM as you will overspend on ads and most likely get a terrible ACoS as a result. These settings are more relevant to huge brands who are possibly willing to spend money on these ads purely for branding purposes or to gain a greater market share WITHOUT optimising ACoS for profit. And I can see how that could work, of course. You could set these campaigns in such a way that your listing will ALWAYS show up in the top search position to achieve massive exposure. I do hope to see all three of these features implemented one day, but for now, we work what we have and try to make most out of it, right?! 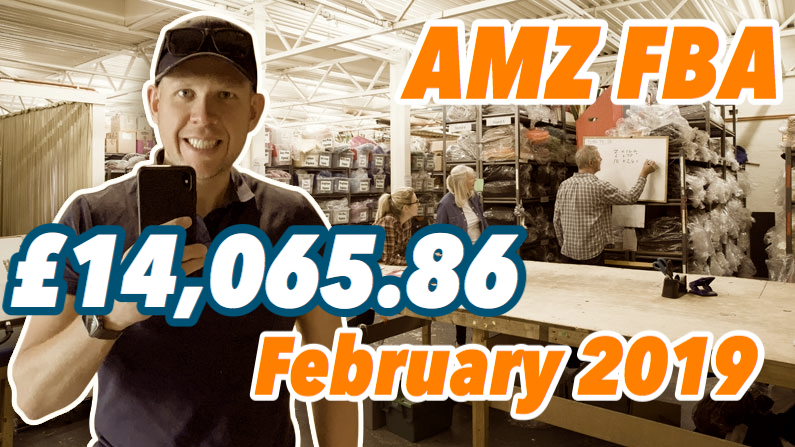 With that out of my mind, let’s move onto my actual trading results on Amazon UK for February 2019! As usual, I will go over my sales, expenses and give you my NET profit number at the end. I have been doing these posts for more than a year now (CLICK HERE for ARCHIVE! ), and the dividends are finally starting to pay out! By that, I mean I can now easily go back and compare sales data for the same period last year and make conclusions and predictions based on that. And it’s not just sales data! I can see that information in my Amazon account any time I want, it’s all the comments and thoughts that I had written down at the time that help too! Plus, I have all the costs and net profit calculated in these posts, so it is now very easy to compare my results thanks to these monthly posts I have been creating. So, I make a profit of £4 each time a unit is sold from organic search results. 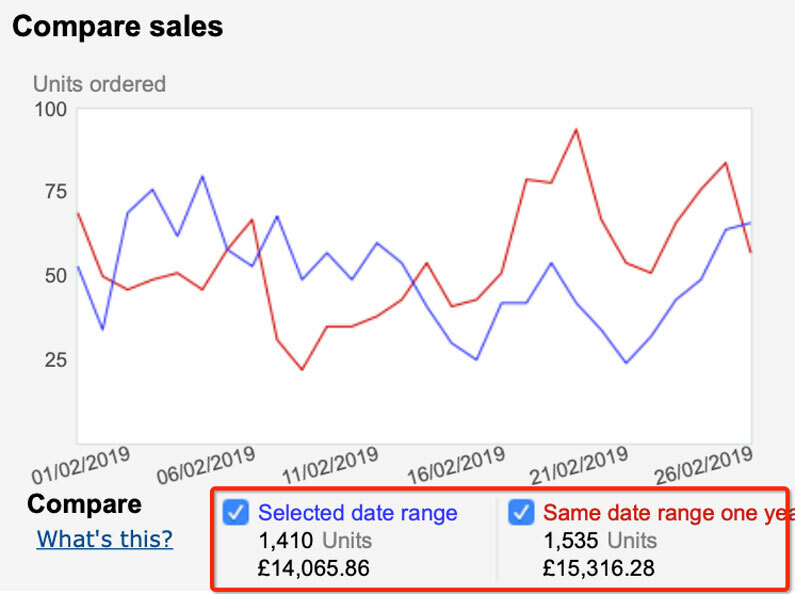 In February 2019, I sold 1410 units, which resulted in sales of £14,065.86. But that is not my FINAL NET profit as I do also run ads to promote my products. My advertising costs last month came in at £1,431.02. As you can see, the ACoS number—usually at 40% or so—has increased to 58%. This is mostly due to the fact that I was playing around with the new Dynamic Bid and Placement Bid features. As you can see, it didn’t really help me much with sales and my ACoS went up. The biggest reason for the sales drop is, as I said, the increase in competition. However, I also feel that the whole Brexit saga plays a part in this too. I don’t know; I just “feel it” from my other businesses that people are simply holding off on spending right now until we know for sure how it will all play out. I don’t sell an expensive item, though, so from what I have heard, businesses in more luxurious markets will suffer most right now due to the uncertainty around Brexit. Anyway, hopefully, the situation will continue to improve. I already have an action plan in place. The first thing I need to work on right now, Amazon-wise, is cleaning up my PPC campaigns. At the moment, they are too chaotic and not 100% optimised (by any means). 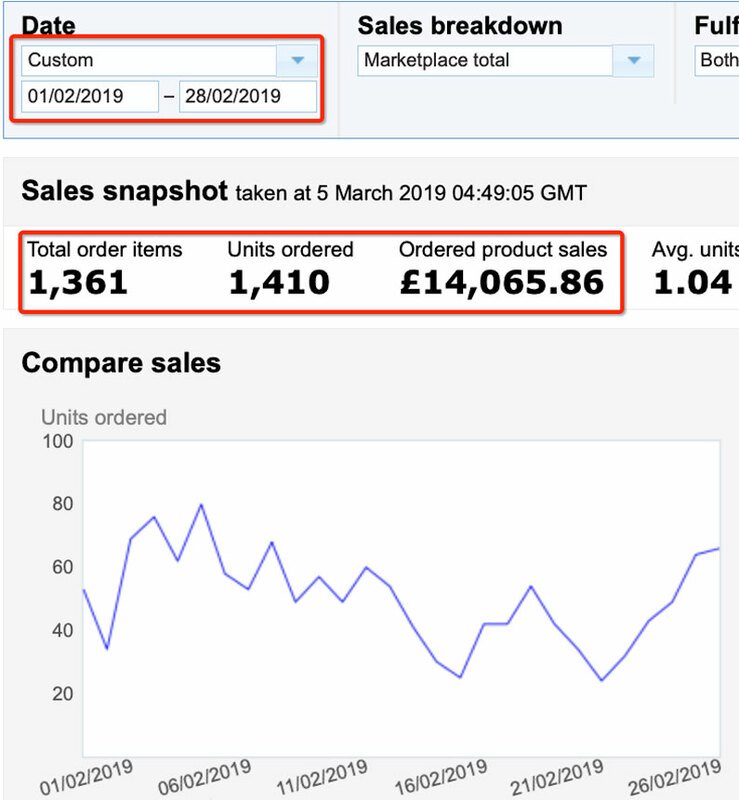 I have already started working on this task and, by the end of March, I should have perfectly optimised and organised campaigns for all my product variations in place. The coding process has almost been completed. Basically, I’m waiting for the LIVE version of the site any day now (super EXCITED about that!). I have all the product descriptions written, the category descriptions are almost finished, and my product images are done, so it’s basically a matter of putting it all together going live. I don’t think I will do a hard launch, though. I’m too afraid of doing that before everything is 100% set up properly. Instead, I will do a soft launch. Then, after a few weeks and when everything has been tested (including payments, fulfilment integration, etc. ), I will start all the advertising on Facebook, Instagram, etc. Work continues on these three events, too. I am actually a little bit shocked by how much work goes into planning such trade shows. I have now received MANUALS for each show, each of which is like 100 pages and contains so many details and things to keep in mind that it is a bit overwhelming at the moment. Everything is in progress! I am SO HAPPY that I don’t have to do it all on my own—seriously! So far, I have signed dozens upon dozens of lengthy forms! But all I had to do was just SIGN them and send them off to the VAT Global office. I can’t imagine how I would have filled them out on my own (I have a “thing” for lengthy forms and documents—I HATE THEM!). There’s not much I can do to speed up this process, and I don’t have any concrete dates for when I will get the first numbers. I just do what they tell me to do and wait. One thing I can say for sure: if you have received an email from Amazon about the special VAT deal where they cover the registration fee and returns fee for one year, GO FOR IT! Even if EU expansions don’t work out for you, you will have the numbers in place. And if you don’t need them in the end, it is relatively cheap to de-register (less than £100 per country). So, there are no risks really with this promotion. You can get it all done for FREE and use it if you need it. If you don’t need it, don’t use it! A lot of work goes into this on a daily basis. I do want to have an optimal product portfolio when I hit the first trade show at the beginning of June. As you can imagine, this involves a lot of work on the actual product designs, making samples, setting up production/logistics/images/descriptions, etc. I am constantly working on this, investing time and money so that my business can grow on Amazon, as well as ensuring that it’s ready for my online shop launch and the offline market, too! This will be the stand for the products I will be offering to new wholesale customers. My idea is to create a special deal or bundle where for £99 (+VAT), wholesale customers get 48 units of the product and the display stand, which is worth £60 alone. This deal will cost me some money, as the £99 won’t cover it, but I see this as a great way to get into new shops! Hopefully, my plan will work out. And that’s about it! I hope you enjoy my monthly update posts and get some value out of them! If you have any questions about what I have covered in this post, please leave them below in the comments section. I will personally reply to all of them within 24 hours, Monday to Friday. If you’re just starting out on Amazon FBA, make sure to check out my blog’s ARCHIVE page where you will find HUNDREDS of posts about eCommerce, importing, branding, Amazon and many other related topics. In the 20+ hours of video lessons, I show you exactly how I set up the business I talk about in these monthly posts! Yes, by video, I teach you everything you need to know about selling on Amazon, branding, importing from China and everything else. PLUS, I provide real-life examples from my business while doing it! If you’re interested, check out the course at AmazonSharks.com. Lastly, I also run a Facebook group which is 100% free to join. When you join our group, you gain access to an active and supportive community of Amazon Sharks members, fellow blog followers and me! This group is an incredible resource for advice, support and information. Click here to find out more. Have an amazing March, everyone! Until next time. Have you considered taking a consignment approach with wholesalers? It could be easier to get into stores if you only charge them once the stock has sold. If I buy your guide. How much £ actually I need to have to start my journey in Amazon? You will need at least £1k to invest in stock, branding, product images etc. That’s the absolute minimum. The more you can invest, the better of course. Was there a reason you chose VATGlobal and not the other two companies? Im just about to start the process, so just interested? They had one of the lowest prices with very good reviews – that was the reason why I chose them. Thanks for posting all your advice and tips. It’s both useful and interesting to follow your progress. Always appreciated!